Looking from the freight shed end, of course there will be support posts along the edge of the roof canopy. Wouldn't it be better if the support posts came down from the peak. That way you wouldn't be obstructing access to the car doors? Make sure it's able to service Superliners ...they are all the rage these days ! Why not? 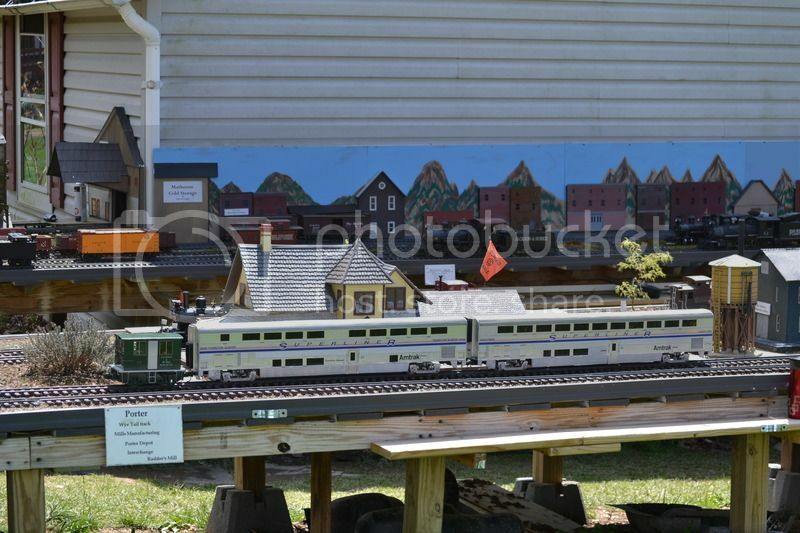 Amtrak has had a penchant for derailments. So does Rooster ha ha! Well it has been raining for 39 days and 39 nights, sure hope it quits tomorrow . So the new travel trailer is just sitting in the yard ready to go camping but it is just to damn wet, actually I was in the shop yesterday drawing up some plans to install pontoons on it but it didn't seem practical . Good news is I have had a little time to work on the railroad. So have a couple new projects underway and making some progress on the new Redding Depot. The basic box framed up using 1/4 inch plywood and 7/16 siding. Remember this is under roof and will not be directly exposed to rain/sun but even so I sealed the entire inside and bottom edges to help with moisture intrusion. The dormers are installed and the barge rafters and eve boards are on and painted as is all the overhang on the bottom side. 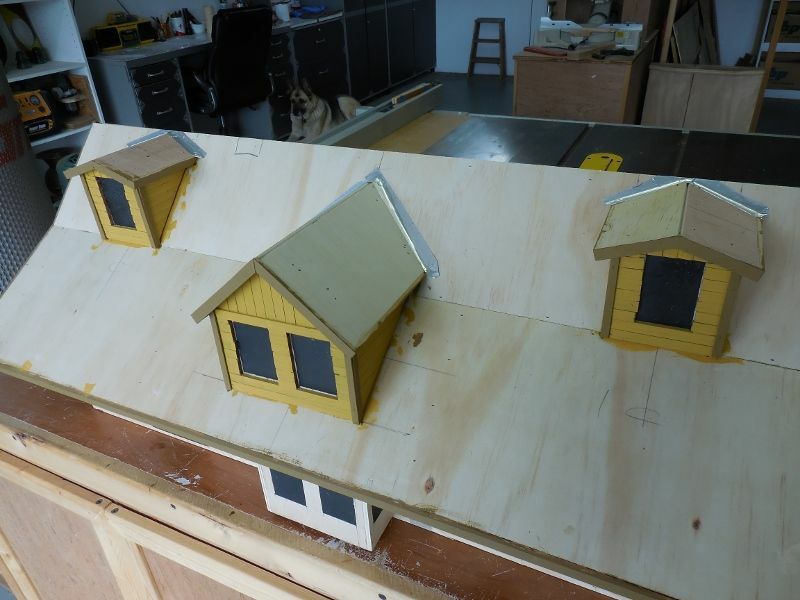 I have to put siding and trim on the dormers and paint them before I can install roofing. 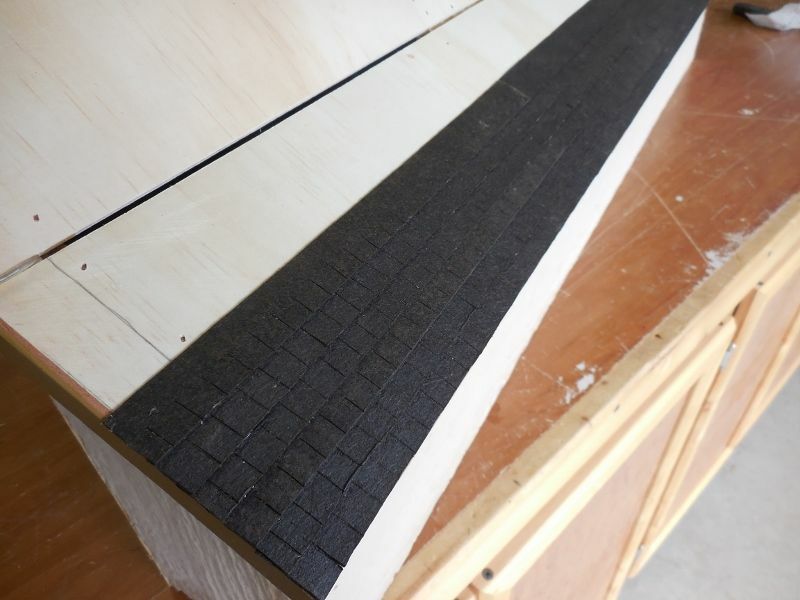 Speaking of roofing I have decided to use 15 pound roofing felt cut to look like asphalt shingles. Asphalt shingles would be very cutting edge" in 1939. Only 14 windows and 2 sets of double doors to build, dang I hate repetition, here 9 are done and only 599 to go. 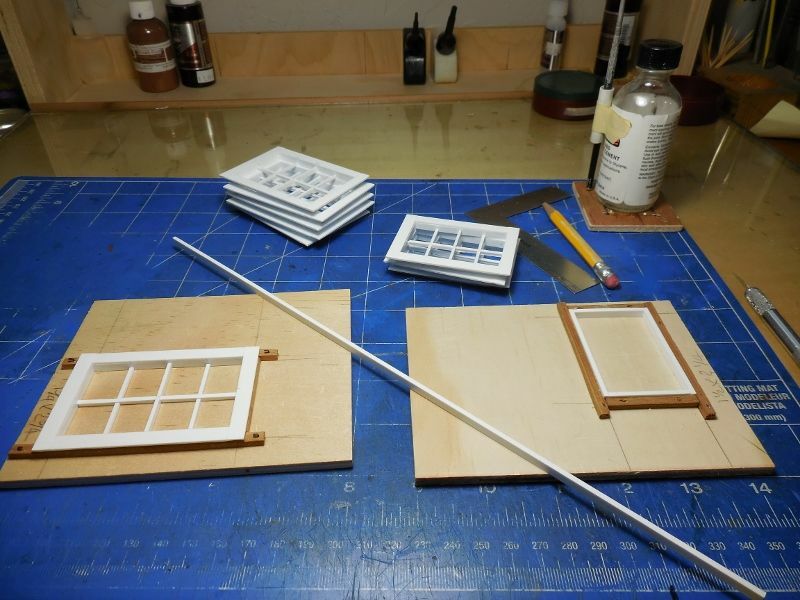 As you can see I am using Styrene for the frames, Acrylic will be used for the reflective glass and they will be installed over the black blank outs on the building. Well it has been raining for 39 days and 39 nights, sure hope it quits tomorrow . Well, it isn't like you guys don't need it out there, but we went through the same thing here. But it does get better. Had a nice week here weather wise, so I had a chance to clean up the layout and get it ready for the Ops session. Your right we do need the rain, but rain gets to be like broccoli after a while, you know its good for you but the more there is of it the harder it is to swallow. Got the windows all built anyway . Good luck with your OP's sessions, wish I could be there. Dan, I just used a clear poly-varathane I had on hand. 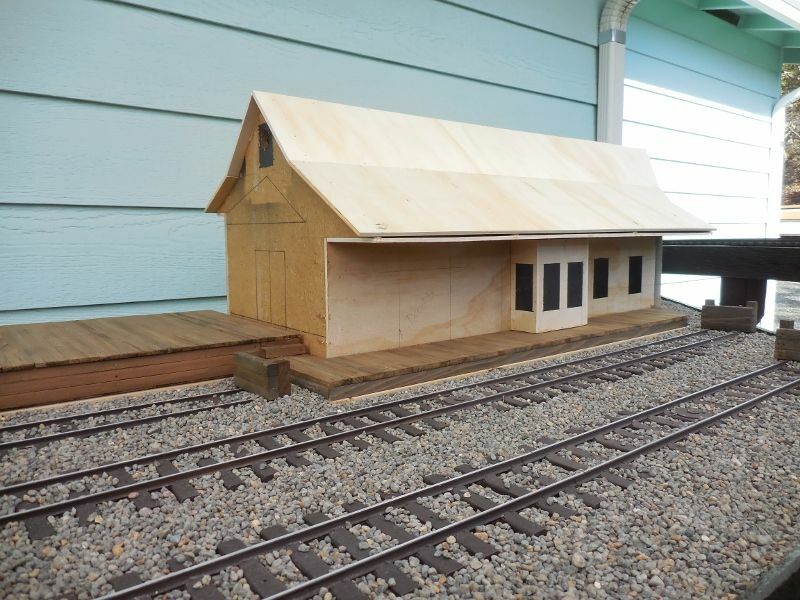 A little progress on the depot building. Got the dormers sided and painted so I can start on the roofing. The window frames are all finished and painted so the ones in the dormers can go in at any time. The silver tape is gonna, supposed to, look like valley flashing once the roofing is installed. 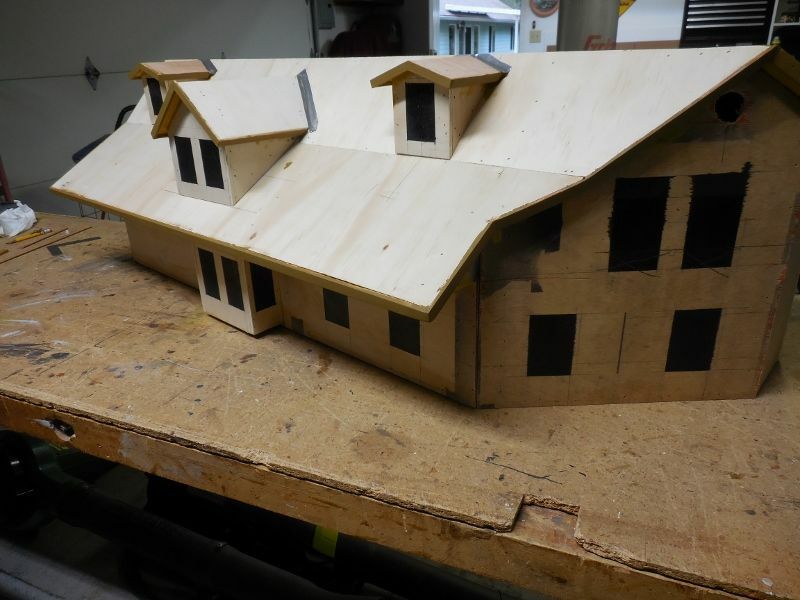 Starting to install the roofing, 15 lb building felt cut in strips and notched to look like wood shingles once painted and weathered, this should hold up really well as it will git no direct sun. Using E6000 to glue it on, good quick grab and has a flexible holding power once dry. 15 million more shingle cuts and the roof will be done. It's coming along very nicely!